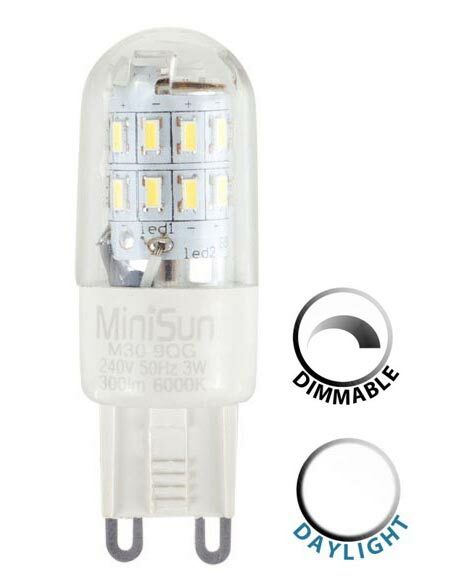 This 3w Dimmable LED G9 capsule bulb in daylight white and 300 lumen is a direct replacement for a 30w halogen lamp. Daylight 6500 kelvin and suitable for any light fitting. Best suited to any fitting that takes 25w G9 capsule bulbs, this dimmable LED light bulb is energy efficient and bright. The light produced is very white daylight but does not contain infra-red or ultra-violet light or give off a great deal of heat. The light is uniform, with a 360° light spread so you can save money and electricity. Dimmable range of 30-100%. With an estimated 20,000 hour lifespan they are excellent for use in touch lamps as an alternative to shorter-lived incandescent and halogen bulbs. Please note: This lamp is slightly taller than a standard G9 capsule, please check the dimensions below to ensure it fits prior to purchase.